Saturday’s workshop with the three visiting Riji teachers was both a delight and a challenge to attend. 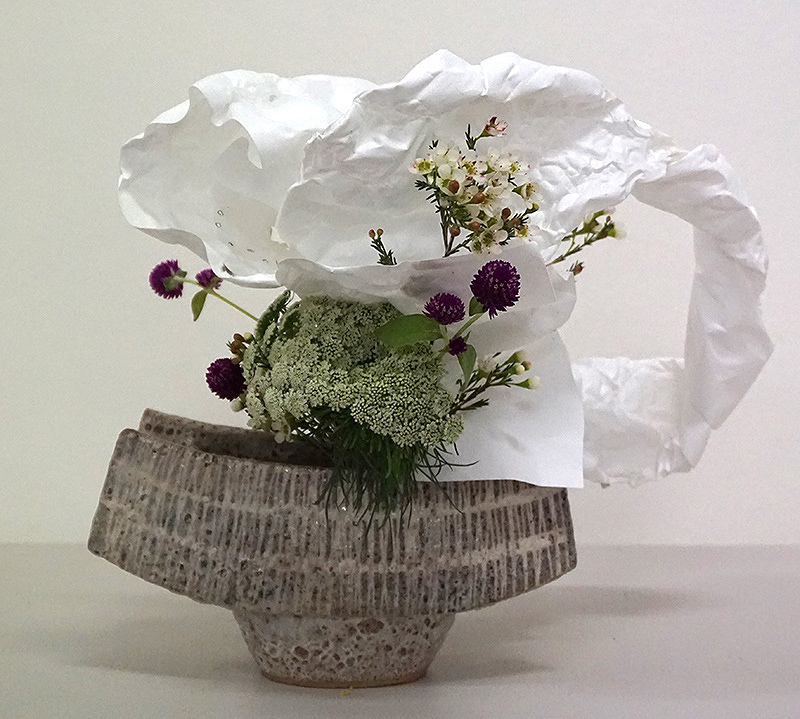 The morning exercise involved creating an arrangement using randomly assigned containers and plant materials. On first arrival everyone selected a place to sit to discover that each place had a number, once all the places were filled each person was to leave their containers at that spot but move to a place number picked “out of the hat” so to speak. The idea was to overcome the tendency to select and work in containers that we had a conscious or even unconscious preference for and to break out of the habit of repetition. It was a fun challenge that encouraged people to try new things and it resulted in arrangements from all involved that had a particular freshness about them. The demonstration arrangements from the masters were both inspiring and innovative, helping everyone to break out of their established ways of thinking and their feedback was greatly appreciated by all. Following was a bento box lunch as well as two presentations of certificates to students that had attained new levels of achievement. Then it was straight on into the afternoon workshop. In this workshop the masters introduced us to a new kind of material. A kind of polymer based paper product that is made from polypropylene. Like most paper it was possible to cut the material in any number of ways but it’s unique feature was in how it responded to heat. The material was not only water resistant but would rumple up into cloud like forms or complex creased structures depending on how and where heat was applied. If heat was applied using a candle it also created soot marks for an added element of contrast to the white surface and finally if exposed to enough heat a hole would open up in the material. Attendees at the workshop utilised all of the options in how they worked with the special paper by spending some time early in the session experimenting with it to explore it’s potential as a novel new material. 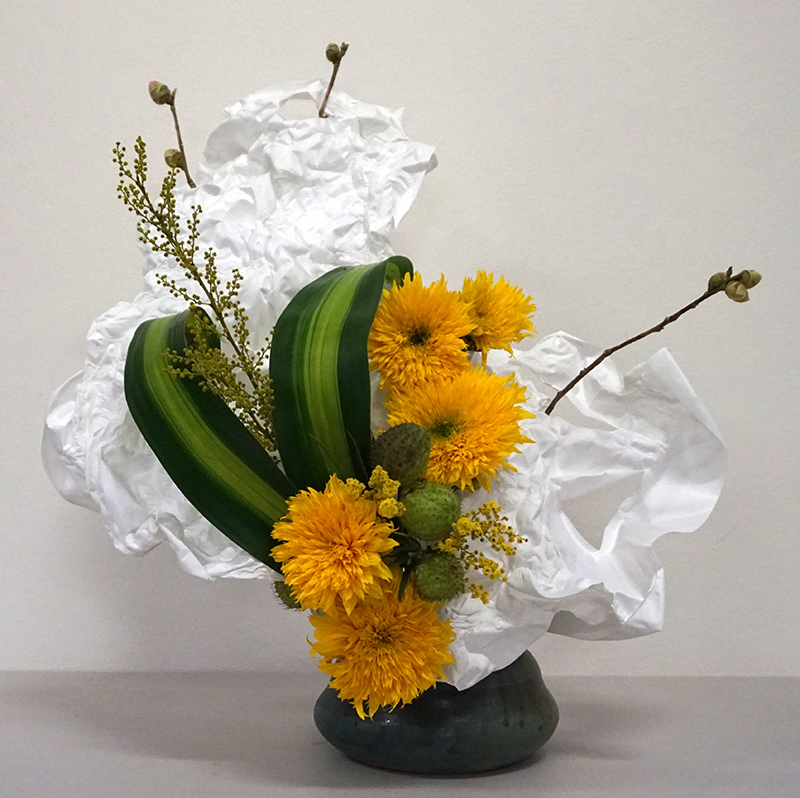 This experimentation payed off greatly as everyone was able to create arrangements incorporating the paper that were innovative and interesting. The masters even remarking on some that they were entirely new uses of the material that they had never seen before. Finally it was time to thank the masters and say farewell and clean the hall. All up it was an interesting and challenging day filled with happy ikebana artists excited by the opportunities and new knowledge that the masters had presented.